Winter is not the friendliest time of year to perform outdoor maintenance, but regular maintenance is needed for your outdoor lighting to do its job. Winter is not the friendliest time of year to perform outdoor maintenance, but regular maintenance is needed for your outdoor lighting to do its job. Here are some simple winter maintenance tips to help take care of your outdoor lighting. In order to properly diffuse light throughout your paths and landscaping, you should regularly clean the lenses of your outdoor lighting fixtures. Everything from dirt, to debris, to mineral deposits can build up and block light. This is especially true for low-to-the-ground light fixtures around paths and anything treated with ice melt or rock salt. Use a soft microfiber cloth and the appropriate cleaner to keep the lenses clear and working properly. Over the course of the winter, snow and ice will freeze and thaw in your yard many times. As a result, wires from underneath your outdoor lighting can become exposed or work their way up to the surface. Make sure that you re-bury the wires before the ground freezes and the job gets more difficult. However, if the wire appears to be damaged at all, make sure that you repair it and do not use that outdoor light until it is fixed. Call a professional at Aqua Bright and we will be happy to help with this aspect of your winter maintenance. 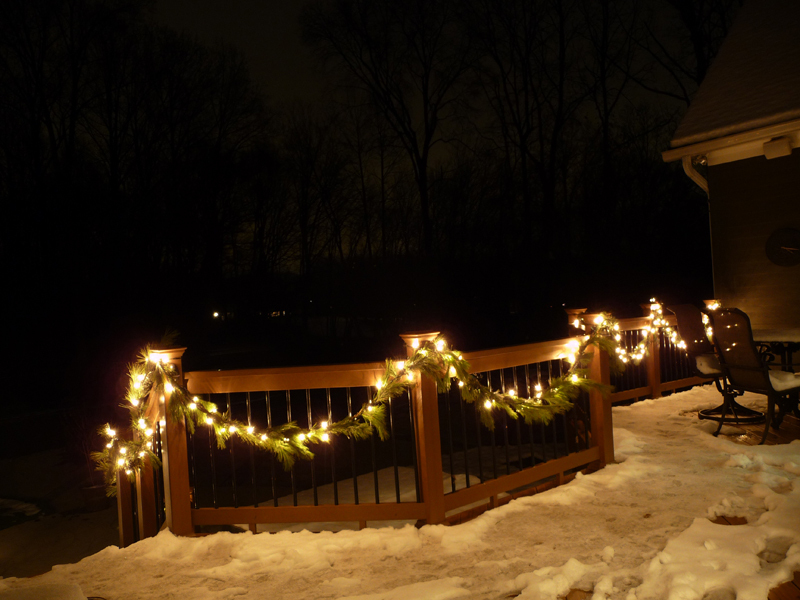 Since the temperatures over the course of a Maryland winter can wildly vary, the lifetime of your outdoor lighting bulbs can be drastically shortened. Once you notice a bulb that burned out, change it out with a new one. If you have a low voltage system set up, every bulb takes energy while they run. Once a bulb stops working, the working bulbs get more voltage. The increase in voltage can decrease the life of the bulb as well. Aside from temperature concerns, the longer nights and shorter days mean that your outdoor lighting is getting more use—again, leading to a shorter bulb life. Whatever the cause of your landscaping outdoor lighting woes, the professionals at Aqua Bright can help you come up with a solution. For a consultation and to hear what we can do for you, give us a call at (410) 489-9009 or visit us online. For more information on the many irrigation and illumination services we offer, follow us on Facebook, Twitter, LinkedIn, Google+, Houzz, YouTube, and Pinterest. This entry was posted on Thursday, January 26th, 2017	at 4:52 pm	. You can follow any responses to this entry through the RSS 2.0	feed. Both comments and pings are currently closed.